Jumping Princess, originally uploaded by Temeculamom. My husband recently got me photoshop, but I have been too busy to learn it. So today, I just decided to jump in and go for it. I downloaded some free kits from 2Peas and Shabby Princess and just gave it a shot. I sure have plenty to learn, but it was a lot of fun, and easier than finding my disorganized scrap stash. It will be interesting to find out how well this prints out. 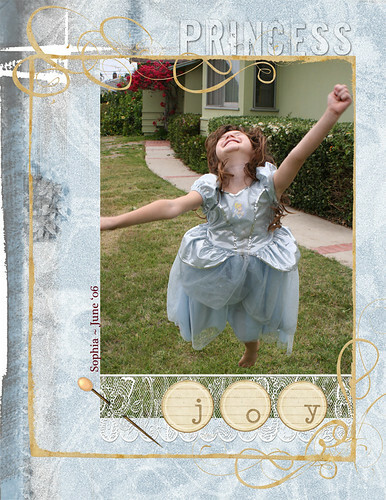 Do you digital scrappers print your layouts on photo paper? Any advice is welcomed, as I am totally brand new to digital scrapping. ~ by bekaboo on May 10, 2007. Wow, fantastic job! I can’t believe you learned enough to do that in just one day! I know plenty of people who digiscrap print their layouts – I think if you have a normal printer you won’t be able to print 12×12 pages, but obviously other sizes would be okay. And there are some big stores in the US that will print for you in 12×12 size. I cannot believe this is your first digi layout Beka! It’s gorgeous. You’ve done a fabulous job. I suggest you print it out on photo paper. I assume you’ve done it in A4 so that makes it easy to fit to the page. I wrote a tutorial on printing your 12×12 digi layouts you might like to check it out. Aw, thanks for the gracious replies, ladies! I formatted it for 8.5 x 11, but I need to get some ink before I try printing it. Karen, I will check out your tutorials. I did refer a tutorial from Scrap Girls to get me started, but then it seemed fairly easy once I knew how to set up the paper size and add the photo. I used Photoshop help for the rest. Can’t wait to learn more, but that will probably be summer. I can’t believe the number of great free kits that 2Peas and Shabby Princess have. wow thats way cool. Go you for completing it. It is stunning. Awesome! Miles above what my first digi page was. “course I think I did it five years ago, I’ve come a long way baby! Still, I don’t think even now that I could do as good of a job as you have though.